Luxurious wine rack table top is a beautiful component in the complete wine rack kit. Designed with a handcrafted look that completes fine custom racking, at a price that only a modular kit could offer. Luxurious wine rack table top is a beautiful component in the complete wine rack kit. Designed with a handcrafted look that completes fine custom racking, at a price that only a modular kit could offer. Table top can not be used alone, and must be assembled as kit component for complete look. Available in classic finishes to showcase a lifetime of appeal and quality design. Wood Table Top for 6 Column Wine Rack - Size: 11/16"H x 27-11/16"W x 14-3/16"D - Made in the U.S.A. This item ships directly from the manufacturer. Please allow 2-4 weeks for delivery. Select items will have additional shipping charges, please see above for this item's additional shipping charge. Express shipping options are not valid on items shipped directly from the manufacturer. Shipping rates apply for orders shipped to the contiguous 48 US states. For orders to Alaska, Hawaii, Puerto Rico, APO/FPO, or islands off the US (i.e. Martha's Vineyard, Kiawah Island, etc.) addresses please call 914.345.9463 for current rates. Sorry, we cannot ship items to a P.O. box. BEST ANSWER: Thank you for your question. The table top for the half height rack is 11/16 high. You may be wanting to know what the height of the actual half height is. The half height itself is 34 7/16 H. Any other questions please call us at 800-377-3330. Is there a mistake on the height? BEST ANSWER: Not on the one I installed. Send email and I will send pictures of the completed wine cellar if you want. How many bottle will this rack hold??? I can't believe that the description does not tell you! BEST ANSWER: The half height rack will hold 54 bottles. how many bottles of wine does this hold? BEST ANSWER: Same Question Answered By Seller: Item 6064908 is just the table top. If you want the wine rack below it, this is item 6064907 and the rack holds 54 bottles. This is the actual table "top" that sits on the half height rack. The rack itself holds up to 54 bottles. Looking for that missing element in your wine cellar that will spell "complete" for your wine racking system? It has got to be our Wood Table Top for 6 Column wine rack! 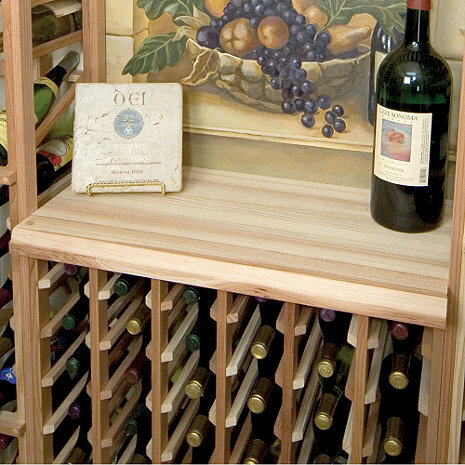 This fine, hand-crafted tabletop is just the right piece you need to literally "top off" your wine racking system and give it the customized touch it needs. Highly functional, this tabletop makes for both a great wine tasting area in your wine cellar as well as a display counter for your wine accessories. Dress it up with our stain options and custom finishes for a truly personalized look! At [$], who can go wrong with it?